Never toss out icing leftover from a decorating project. There is more in those piping bags and squeeze bottles than you think. Use a small spatula to scrape icing from squeeze bottles. 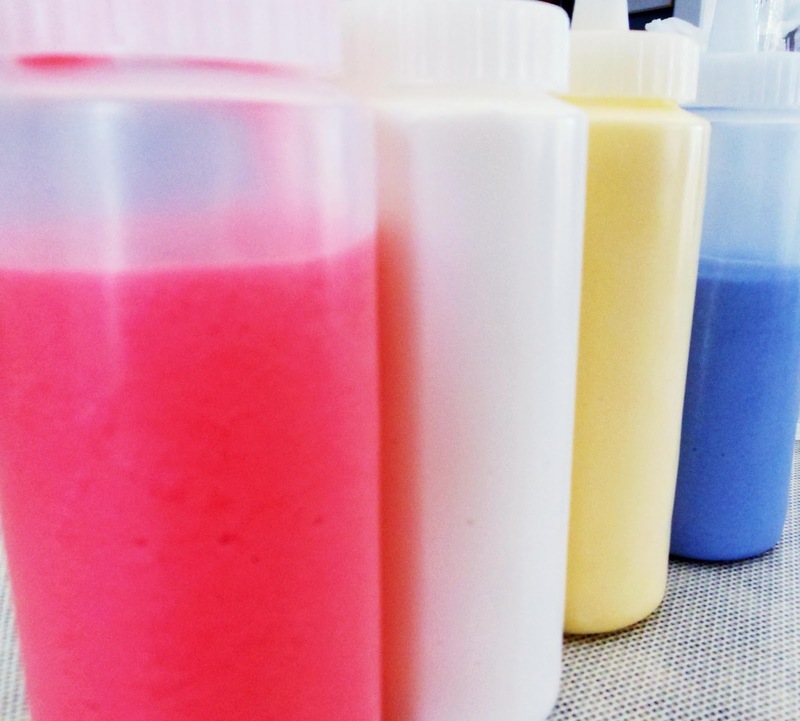 I usually mix like colors together, put icing in small containers and store in the refrigerator or freezer. Icing will separate and get watery during storage so a spoonful or two of Confectioner’s Sugar may be needed to return icing to the proper consistency. Heart cookies are not only for weddings, anniversaries and Valentine’s Day. 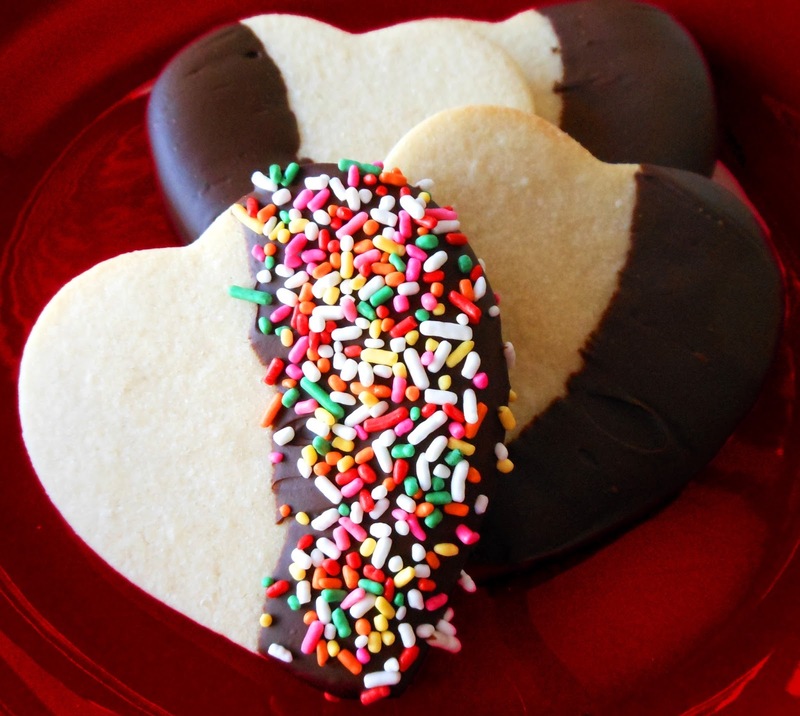 Cookie decorators make heart cookies all year long. 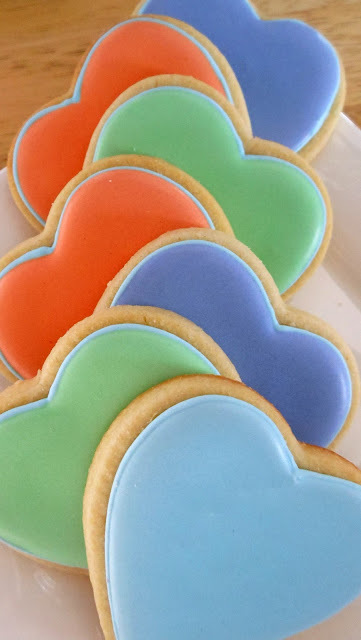 These hearts were made in a variety of leftover icing colors. I usually choose one of the leftover colors for outlining and use the other colors for flooding. This design is simple and sure to impress. 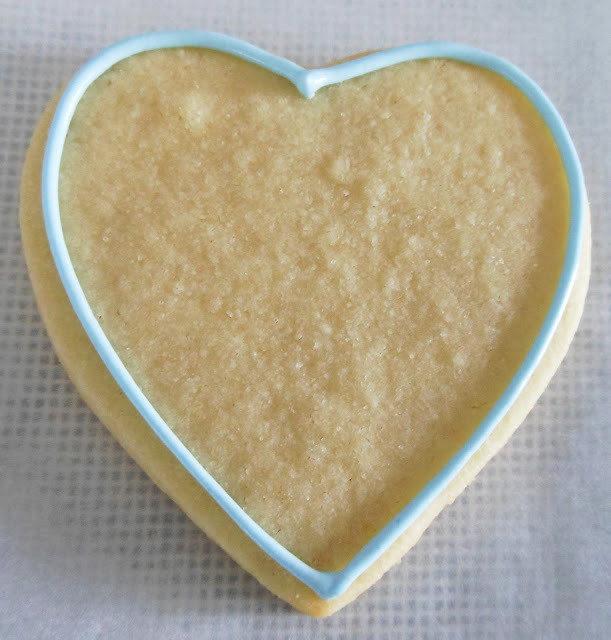 Outline cookies with #2 tip in blue icing. 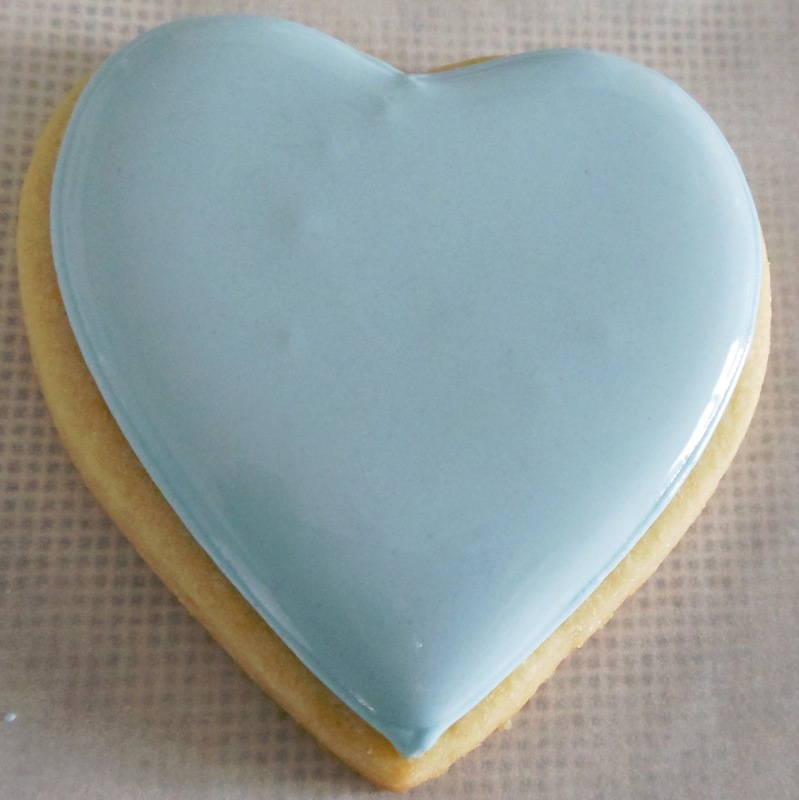 Flood cookie with blue icing. Flood other cookies with purple, orange and green icing. Let dry overnight. Great tip! Thank you so much for that. I never knew you could even freeze royal icing! Colleen, You're welcome. I keep icing in the refrigerator up to 10 days. When I freeze icing, I let it thaw in the refrigerator. When I decorate, I put the icing on the counter for a couple of hours to come to room temperature. The colours are great on these cookies. I too have had good luck with freezing royal icing. Paula, Thanks. I freeze decorated cookies too. The key is to thaw on kitchen counter and leave in covered container until the cookies are completely thawed. Amy, Thank you! I just stopped by your blog...very nice! Monica, Thank you. There's something really sweet about the heart cutter and it's one of my favorites. 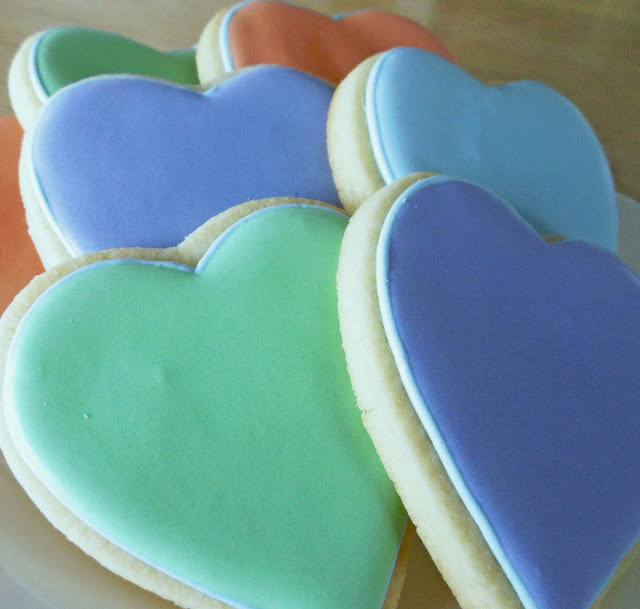 Many of the colors for my cookies start from leftover icing, and combining like colors can result in really unique colors. My shortbread cookies keep their shape nicely and spread very little. I think it is because there is no baking powder in the recipe. Some cookie decorators cut out their shapes, then chill them on the cookie sheet for 15 minutes before baking. I did that for awhile but it took too much time. I think it just comes down to the recipe. You can find it on my 'recipe' page. It is adapted from the cookie recipe used by Karen of Karen's Cookies. Anne, Thank you! The heart cutter is very versatile. The easy curves make it a good cookie for beginner decorators. Look for future posts using the heart cutter. Stopping by from Treasure Box Tuesday. 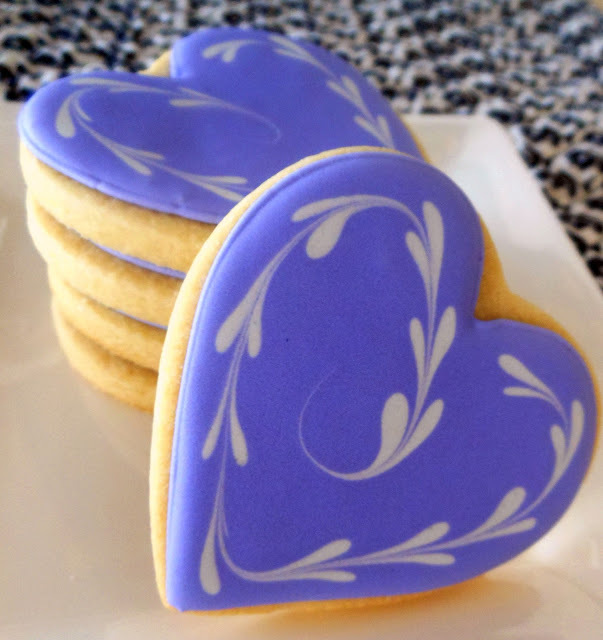 Your cookies are absolutely gorgeous! I love how you paired up different colors for the outline, and the flooding. Fabulous! Kris, Thank you! I appreciate your visit from Treasure Box Tuesday. I too like the look of the contrasting outline. The Double Chocolate Muffins on your blog looks fabulous!